HBsAg (hepatitis B surface antigen): This is a protein that is found on the surface of the hepatitis B virus molecule, a part of the virus itself. When they find a significant concentration in your blood, it shows you have a hepatitis B virus infection, which may be chronic or acute. This protein sets off your body's immune response, and if your immune system is functioning correctly you will soon produce measurable levels of anti-HBs antibody. The hepatitis B vaccine uses this antigen to stimulate immunity to the virus. anti-HBs (also called HBsAb, hepatitis B surface antibody): Your body produces this antibody when it is exposed to HBsAg, whether from being infected with hepatitis B or being stimulated with the hepatitis B vaccine. It is a sign that you are recovering from a hepatitis B infection or that you have had a good response to the vaccine and should have protection from the virus. anti-HBc (also called HBcAb, hepatitis B core antibody): Your body develops this antibody in response to the presence of hepatitis B virus at about the time you show symptoms of acute infection. Once you produce it, you generally will continue to make it the rest of your life and so your blood test will remain positive for anti-HBc. It shows that you have an infection or that you had one in the past, but it doesn't tell your doctor which is the case. IgM HBcAb (or IgM anti-HBc) is a test for evidence of a type of antibody that your immune system produces during or just after an acute hepatitis B infection. A positive test usually indicates an acute or recent infection. The antibody is greatly reduced or disappears after the infection is resolved. If you're acutely or chronically infected with hepatitis B, then it's possible for you to spread the virus to others. Follow standard prevention and make sure to protect yourself and others during sexual contact. 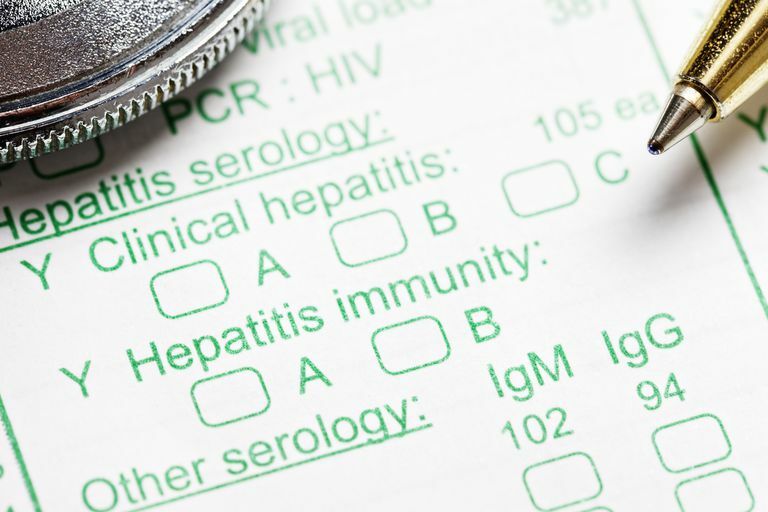 You're probably susceptible to hepatitis B. If you are eligible for the hepatitis B vaccine, you could get vaccinated to reduce your risk of infection in the future. You're probably immune due to natural infection. You don't have the viral antigen circulating, but you are showing both antibodies. The core antibody is the one that indicates this was due to infection rather than vaccination. Often people are surprised to learn they had an infection in the past, as many cases have only minor symptoms. You're probably immune due to hepatitis B vaccination. Often this is the result seen on follow-up after immunization and it is a good outcome. If you weren't vaccinated, that is something your doctor will explore further. You're probably acutely infected. The presence of IgM anti-HBc, along with HBsAg, shows that there is virus circulating in your body and you are producing an early reaction to it. This wouldn't be the case with a chronic infection or an infection further in the past that you recovered from. You're probably chronically infected. You are continuing to make core antibody and you have virus circulating, but your early IgM antibody has faded away. With this result, it could be several things, the most common of which is that you had a hepatitis B infection that has resolved or is resolving. You probably aren't in the acute infection stage. You might have a false-positive test for the core antibody. You aren't immune to hepatitis B, so you need to take care with exposure risk and you should discuss whether vaccination is advised. You may also have a low-level chronic Hepatitis B infection. Centers for Disease Control and Prevention. Viral Hepatitis B Testing and Public Health Management. Interpretation of Hepatitis B Serologic Test Results, Centers for Disease Control and Prevention, Division of Viral Hepatitis.